I have never been a big breakfast eater. The idea of consuming anything before noon generally repulses me so I stick to a coffee during the school year to keep me going until lunch. But during a summer internship in New York after my sophomore year, my morning Starbucks run no longer sufficed. By 10 am, after an hour sitting at my desk, I was starving and counting the minutes until my lunch break. Instead of diligently updating the company’s databases, I drifted into daydreams about bagels and grilled cheese sandwiches. I soon learned that a good breakfast was crucial in getting me through the day. After some experimenting with “power breakfast” options, I settled on two strategies: protein and carbs. Protein. According to my doctor, early-morning protein meals can boost concentration and performance throughout the day. When you’re slugging through the sometimes tedious work of an intern, a little extra concentration never hurts. Eggs are a natural breakfast go-to for protein. I love (and have previously extolled the virtues of) scrambled eggs on toast. Another favorite is a grilled cheese sandwich dressed up with a fried egg. If your job leaves you wiped in the mornings or if you’re short on time, as I often am, hard boiled eggs are a great breakfast snack that you can make the night before and keep in the fridge and eat on the way to work. Carbs. If I had my way, every breakfast would be a pancake breakfast. This was pretty much impossible for me as a pre-internship option (since I was usually running to be at my desk by 9:00am), so instead I relied on oatmeal to keep me full until lunch. Oatmeal is both hearty and healthy, plus it can be prepared in about three minutes. Kashi Go Lean Oatmeal and Amy’s Steel Cut Oats are my two favorites. As I’m enjoying my fried egg and toast before my internship I can’t help but think so true! There is just no way I could make it through the day without breakfast. I’m a huge fan of eggs, but don’t always feel the urge to cook one up so my second in line are frozen waffles. I also try to take my lunch later so it makes the end of the day go faster. I find it helps to take a quick snack break a few hours in to working. Keeps me satisfied til lunch. When I think back to all the times I skipped breakfast, I wince. 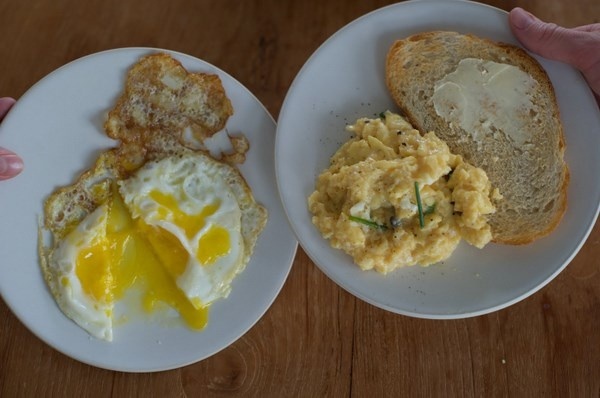 I really love eggs in the morning because they are fast – I can scramble eggs while I throw on a little make-up or toss my hair up and if I don’t have time at home, I dump the eggs in a tupperware and eat them during my commute. this seems the best breakfast for a gym freak. i was looking for something like this. Thanks for sharing this with us. That’s a really good meal for breakfast. You can also contact geek squad tech support team for any tech help.